“We in Ireland are also aware that redressing the consequences of conflict takes steady, careful work, involving as it does not only conflicting memories and narratives of the past”. That’s President Michael D Higgins speaking in El Salvador. As he reminded his audience, he’s always had an interest in the triumph of truth and justice in that far-off country. That’s good to know. Living on an island we tend to be a bit insular in our thinking and it’s good to view the world beyond our narrow borders. On the other hand, you can get excessively engrossed elsewhere. Someone (no, Virginia, I can’t remember who and I’m too lazy to check) once distinguished between a lunatic (from the Latin for ‘moon-struck) and an idiot (from the Greek for ‘one’s own’) by saying the lunatic is one who strides along dangerous ground, eyes firmly fixed on the heavenly firmament; while the idiot is one so caught up in the local, they cheerfully milk their cow while war rages all around. I would never call President Higgins either a lunatic or an idiot – he’s patently neither – but I do worry a little at his tendency to champion causes far from home while giving rather less attention to matters nearer to hand. 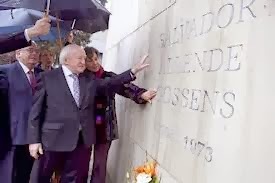 For example, President Higgins spoke at the University of Central America where six Jesuits, their housekeeper and her daughter were murdered by government forces in November 1989. Anne Cadwallader has just produced a book called Lethal Allies which carefully charts government and state forces’ collusion here in the deaths of over 120 people in the ‘Murder Triangle’ in the early 1970s. I do hope the President finds time to speak out against these state killings so much nearer home and 20 times as numerous. Let’s assume for the sake of argument that your beloved Martin had won the Presidential election .Would you be expecting him to speak out against these”state killings”?I think you’ll find out that by and large in terms of matters relating to the “island of Ireland” most Presidents will not deviate significantly from the Government line. Martin isn’t my ‘beloved’ (I’m a married man and have one of those) but I would expect him to speak out against state killings. If you’d like to find out for sure, tweet him – he’s on twitter…. So what exactly is the Irish Government line when it comes to British State forces murdering its citizens ? Martin is not President so your stock response doesn’t apply.I have little doubt that as D F M he would speak out against state killings if not always those carried out by the I R A.. So you’ve surfaced after the savaging you got over inaccuracies and misinformation promoting the Anne Cadwallader book. Im sure President Higgins will do some proper research first before commenting on it. Anonymous 14:43 its sad that you lambaste the messenger and dwell on pedantic froth, rather than constructively enlighten us, on your take on the murder of over 120 innocent nationalists, by British loyalist murder gangs at the behest of criminals in government. As for President Higgins, I’m sure he won’t be commenting on it, given that he has less political clout than a ‘cabbage patch’ doll. Like his predecessor Mc aleese its more likely to be tea and buns at Phoenix park with the East Belfast cabal that were directing these crimes against the Irish people. truthrevisionist. If Jude is indeed the messenger then the message got lost somewhere enroute. As for my take on your claims, I’ll not be rushing in with two six guns blazing unlike Jude and yourself. And as for the rest of what you say…well what can I say about cabbage patch dolls and tea and buns which hasn’t already been said.